Cornerstone content is not a new concept. In fact, Brian Clark, founder of Copyblogger, wrote a guide on how to create cornerstone content back in January of 2007. It’s a key SEO strategy that’s becoming more and more prevalent as Google inches closer and closer to preferring real, well-written content over keyword-stuffed and generically-written blog posts. It also gives a way for new and under-performing websites to gain an edge over their competition. Cornerstone content is a concept new and existing websites need to get behind. We’re going to go over what exactly this type of content is, how it differs from regular content, why it’s important and how to implement it into your content marketing strategy. Let’s get started. 2 Why is Cornerstone Content Important? Cornerstone content, or cornerstone articles, can be described as being among the most important pages of your website, right up there with your home, About and Contact pages. They’re the top three to five articles that define the main focus of your site, and they’re also among the top articles you’d want new visitors of your site or new members of your niche to read. These are typically long-form articles that are more like guides than regular blog posts. They should explain key concepts of your niche in depth and should be able to spark numerous sub-topics. Here’s a quick breakdown of how cornerstone content is created. You essentially consider which main keywords you want your site to rank for. Find three to five keywords you want your site to target. You then need to come up with one cornerstone article to write for each main keyword you want your site to target. You should not use this keyword to target at any other post or page on your site. All, or most at the very least, other content you create for your site should relate to one of your cornerstone articles, and you should link back to the cornerstone article so Google knows it’s important. Your main SEO goal for creating this type of content should be better rankings for the main keywords you want your site to target and better rankings overall. All of these posts relate to at least one of the cornerstone articles listed above, so the owner of this site can easily build a strong internal linking structure. Again, none of these articles will target the main keywords these sites want to rank for. Let’s go into depth about why this strategy is important so we can explain it a little better. We’ll then get into how to implement cornerstone content on your site. Content marketing and SEO are competitive fields in online business, and domain authority has always been an important aspect of SEO. That’s why many SEOs advise bloggers to create more long-form content that goes above and beyond what other sites are doing. It makes your site stand out as an authoritative presence in Google’s eyes. The entire concept behind cornerstone content is intended to help establish your site as an authority in your niche so the rest of your content appears higher and higher in search rankings. What you want to do is to spend more time, research and maybe even money producing three to five cornerstone articles that have enough authoritative power to boost your search engine rankings for the competitive keywords you want your site to rank for the most. Google’s main intention with each new update it releases to its algorithm is to direct users to the highest-quality articles it can find on individual topics. This is why short-form content filled with generic, poorly-written content stuffed with every keyword available will no longer do. Google wants real content written by real experts. So, if high-quality, well-written long-form content ranks better in Google, why not treat all articles like cornerstone articles? Well, the answer lies in the way Google crawls and indexes your site, which you can learn more about in their explanation here. We’ll sum it up for you. This is your site’s “internal link structure.” Each article you see in the diagram above links to one cornerstone article. When Google crawls this website, it’s led to these cornerstone articles several times, causing this content to be processed more than others. Google takes note of certain signals when it crawls your website. These include the keywords used on each page, how relevant the content is to the most frequently used keyword(s), how up to date the information is and more. When it indexes a web page, it adds it to different entries based on the keywords it contains. The more compliant you are with Google’s ranking signals and the more authority it sees in your content, the higher it’ll place your site in the search rankings for the keywords you want to target. That’s how cornerstone content is intended to work. You spend more resources than you usually would optimizing a small handful of articles or pages (your cornerstone content) and create several pieces of related content to insert links back to that small handful of articles. When Google crawls your website, all of these related pieces of content send crawlers to your cornerstone content. These cornerstone articles should be optimized for the main keywords you want your site to rank for. Google will then index these articles under the entries it has for those keywords. The more authoritative your cornerstone articles are and the more authoritative your entire site is, the higher your rankings will be. Let’s go over a few tips on how to implement this type of content on your site. This is a general cornerstone content strategy. The way you implement this strategy is dependent on how new your site is, but more importantly, how much content is on it. Let’s break this strategy down. Remember, cornerstone content should be among the top pages you want new visitors to your site or new members of your niche to view. This content should represent the most important pieces of information or concepts new members of your niche need to learn to get the hang of things. 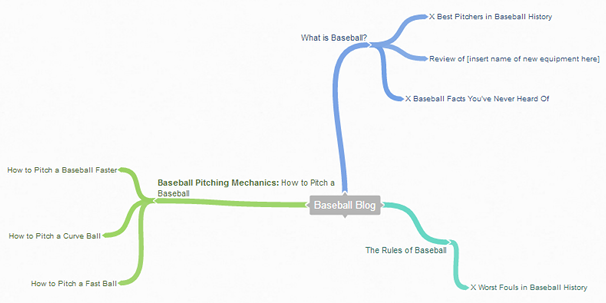 The keywords listed above can inspire numerous pieces of cornerstone content for a website that teaches everything you need to know about baseball, whether you want to play it yourself or whether you want to follow the major leagues. That’s how you should approach keyword research for this type of content, and that’s how you should decide which keywords to use. Think of your niche and the key concepts new members of it need to learn to get started. Write down each concept, and jot down any keyword you think is relevant to it. You can even enter each individual concept in the search bar. For example, the owner of the baseball website could search for “baseball pitches,” “baseball rules,” “baseball equipment,” etc. If you have a lot of existing content that’s already ranking in Google, use a tool like SEMrush or Ahrefs to see which keywords you already rank for. It may make more sense to create a cornerstone article for each keyword Google already attributes to your site. Another thing to keep in mind is that you won’t be using these keywords to target any other pages or posts on your site, so choose wisely. This step is also dependent on whether or not you have a lot of existing content. If you have a new website that has little to no content on it, you’re going to have to come up with topics through brainstorming based on the notes you made in the previous step on the key concepts of your niche and based on the keywords you chose. If you have existing content, go through it, and see if any of your articles can be optimized and re-written as cornerstone articles. If not, you’ll need to brainstorm as well. You might have a format you use for every blog post you create, but I want you to toss that format out the window for these cornerstone articles. These are not blog posts. In fact, most SEOs recommend you to create pages out of cornerstone articles rather than adding them to your blog. If you have a strict word-count policy you typically follow for each post, forget about it. Think quality, not quantity. Decide what topic or concept you need to explain, and explain it in depth. You don’t need to write a novel about the topic, but you do need to go above and beyond what you usually do, and more importantly, you need to go above and beyond what your competitors are doing. 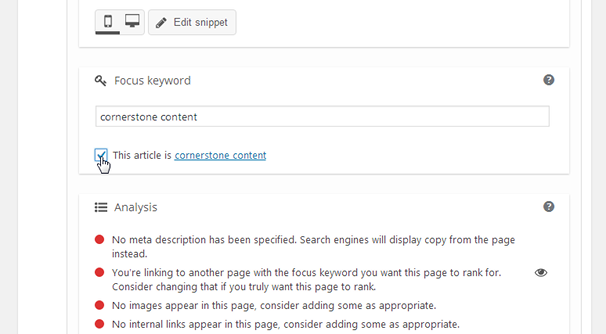 If you use Yoast SEO, make sure you mark your cornerstone articles as Cornerstone Content. These types of articles need to be optimized a lot more than regular articles, and Yoast will adjust its content analysis as such. This step, like the previous steps, is dependent on whether or not your blog has a lot of existing content. You’ll have your work cut out for you if it doesn’t. Your primary objective should be to focus on creating content that relates to your cornerstone articles. You can create other types of content if you need to, but focusing on related content will be a much more efficient way to approach your site’s SEO and content marketing strategies. If you have an existing blog with a lot of existing content, you may be able to find a lot of content that already relates to your cornerstone articles. Go to Google, and enter “site:example.com keyword” into the search bar. Replace “example.com” with your domain, and replace “keyword” with one of your cornerstone keywords. Google will output every page it feels relates to that particular keyword. You can also use the internal linking feature in Yoast Premium. Next, you need to connect your related content to your cornerstone content so Google’s crawlers will be sent to your cornerstone articles. This is where you really need to work on your site’s internal link structure. When you create a new related article for a cornerstone article, make sure you link to the cornerstone article in that related article. If you’re using Google’s list to find related content, add a link to each page Google lists in the search results. If you’re finding related content manually, add a link to each article you feel relates to one of your cornerstone articles. You should also try to fit links to cornerstone articles on your site’s main pages, such as your homepage, About page and Start Here page, and even your navigation menu! Cornerstone content can be an intimidating SEO strategy to tackle as it takes a lot of time and effort and is nowhere close to being a quick solution. However, we hope this guide cleared up this subject for you and made implementing this strategy easier, if only a little. There are a few additional steps you’ll need to take after you have everything set up, and they all have to do with maintenance. Ideally, the cornerstone content you create should be evergreen. The information should be relevant whether you read it tomorrow or 5 years from now. This means you need to keep up on maintenance for cornerstone content. Check on them every once in a while just to make sure the information in them is still relevant. You should also be promoting cornerstone content more than regular content on your site. Lastly, you should work on your email marketing game as well so you can convert all of the new visitors Google sends to your cornerstone articles. With all that said, we hope you now know what it takes to implement a strategy for cornerstone content, and we wish you the best of luck in your SEO goals! Great article. I’m looking for pricing for CC, but can’t find it anywhere. What would you charge per long form post? I am using YOAST Seo but I do not see the checkmark box for the “this is the cornerstone content”. It is only available in Yoast Premium because I am pretty sure we have the latest Yoast seo plugin installed. Why is Cornerstone Content Important? Content marketing and SEO are competitive fields in online business, and domain authority has always been an important aspect of SEO. i like your statement, thanks and amazing! I think if you’re a new website coming up with ideas for cornerstone content though you really need to survey as well. It’s the only way to get true first-hand unbiased feedback. I’ve had some incredible insights come through using surveys. Human engagement requires human informed content decisions. How about if you have an article with only 300+ words and you’d like to mark it as cornerstone? (all other criteria are met) Is it recomended or it is better to leave it as normal article? I first heard of the term Cornerstone content via Yoast SEO plugin and since dug deeper which made me land here. indeed you have help understand it much better. Thanks!